The current HMS Montrose is the eighth of the sixteen ship Type 23 or Duke class of frigates, of the Royal Navy, named after the Duke of Montrose. She was laid down in November 1989 by Yarrow Shipbuilders on the Clyde, and was launched on 31 July 1992 by Lady Rifkind. She commissioned into service in June 1994. 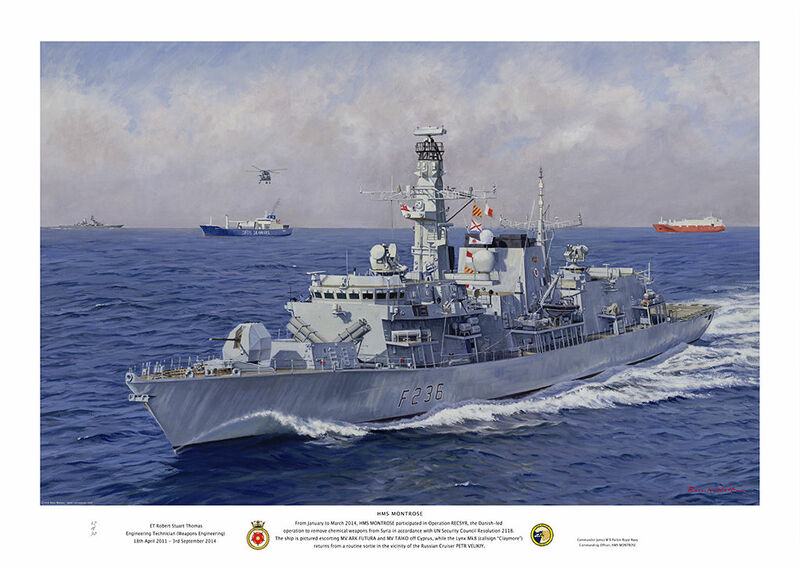 From January to March 2014, HMS MONTROSE participated in Operation RECSYR, the Danish-led operation to remove chemical weapons from Syria in accordance with UN Security Council Resolution 2118.
returns from a routine sortie in the vicinity of the Russian Cruiser PETR VELIKIY. Commissioned by the former commanding officer.